Here is a summary of our 12 day 11 night Everest Base Camp hike. In this post we summarize what to expect from the trail on each day of the hike. We worked with a local agency Sherpa Society Trekking to organize our tour. We had a custom program that included a guide, Ang Nuru and a porter, Jambo who carried our bag. What we both packed for the trek was a combined weight of 12kgs which our porter carried and we each carried a day pack with water and extra layers. With our schedule, we chose to only do one day of acclimatization on the trek which was in Namche. Most schedules have an additional acclimatization day around Dingboche. As we wrote in our post on How To Plan Your Everest Base Camp Trek, it is important to allow buffer days as you never know how your body will react as you ascend. We both got sick during the trek (mainly stomach issues), speaking to other hikers and to the doctors we saw on the trek it is almost inevitable that you will get sick on the trek. We made adjustments to our original schedule to accommodate our sickness. We were able to do this because we were on a custom program. We also feel that having a porter greatly reduced the strain on our bodies and helped us avoid altitude sickness on the trek. We most appreciated that our small group (the 2 of us, guide & porter) allowed us to get to know Ang Nuru and Jambo much better through the course of the trek. To reach Lukla, you fly into Tenzing Hillary Airport, known as one of the most dangerous airports in the world. Lukla flight delays are almost unavoidable as we personally experienced during our first attempt. As a result, the first day itinerary is typically one of the easiest of the 11 days of trekking. Our flight was originally scheduled to leave at 7:45 AM but left around 11:30 AM (not bad compared to the alternative of not departing at all). We arrived in Lukla around 12:30 PM. Upon landing we were greeted at the airport by our guide Nuru and porter Jambo. We immediately left and hiked 3 hours of “Nepali Flat” hiking, which involved small climbs up and down of never more than 100 feet/30 Meters of elevation gain or loss at a time. We crossed several rivers via a few suspension bridges, which is thrilling but not for the feint at heart. 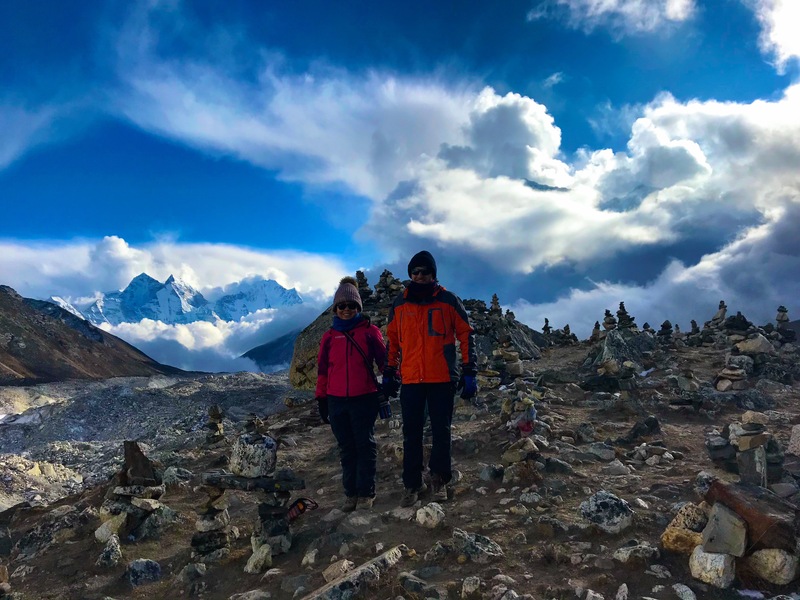 Overall the first day is more of a “warm up hike” and was no comparison to the views and hiking we would experience as we climbed closer to Everest Base Camp. This was one of the hardest days of the trip. It involved the steepest climb and some of the heaviest traffic on the trail. The first 3 hours is relatively flat, it would likely take 2.5 hours, but the trail is packed with other hikers (those going to passes, Gyoko Lake and EBC will not split off to a different trails until after Namche on day 3), lots of Yaks carrying supplies going to and from Namche as well as endless amounts of porters, so this easy section took us 3 hours. We stopped in Jorsalle for lunch, the last town before the steep climb to Namche. After lunch it is a steep 2,000 feet/600 Meter climb uphill to Namche. The entire way is in a wooded section, this is the steepest and longest climb on the entire 11 day trek and and at this lower elevation it can often be fairly hot. After 4 hours we arrived at Namche Bazaar where we would spend 2 days (1 acclimatization day). Namche is the largest town in the area with everything from ATM’s, coffee shops, Irish Pubs and Nail Salons. As we progressed to higher elevation stops, we would think fondly back to Namche and dream of the things we would eat when we returned there on the trek down. Almost everyone takes a rest/acclimatization day in Namche, which involves a short hike to a higher altitude to better acclimatize before returning back to Namche. For any high altitude trek, the motto is “hike high, sleep low” because its much easier to sleep when you go to bed at least 330 feet/ 100 Meters below your highest altitude of the day. In the morning we visited the Tenzing Norgay Stupa (Tenzing Norgay was Edmund Hillary’s Everest guide and the first person to climb Mt. Everest). Here is one of the best views of Mt. Everest. After this day we wouldn’t see Mt. Everest again until the day we arrived to Base Camp. We then visited the Sherpa Museum, providing us a history of the Sherpa people and the area, which we really enjoyed. We then had a 2 hour hike and climbed 1,000 feet/300 Meters to the old airport runway of Namche, which never landed a plane and just lands helicopters. Today building materials are flown into this runway and it also serves as a landing strip of rescue/ mountain flight helicopters. We befriended a rescue helicopter pilot who allowed Quan to try out the pilot seat. The day was over by 12:30 and we spent the rest of the day relaxing at the Sherpa Barista Coffee shop eating French Fries and momo’s, like heaven. It was the last relaxing day on the climb up. This is likely the third hardest day behind the climb to Namche and the day EBC is reached. The hike starts off with a relatively easy 2-2.5 hours of hiking. It involves a 15 minute steep climb out of Namche (this could be a little longer or shorter depending on where in Namche you are staying). There is then another 1 hour of flats on a wide trail before heading downhill for about 1,000 feet/300 Meters for about another hour to the low point on the route, which is before you cross the water over another shaky bridge. The next 2.5-3 hours is a fairly steep 1,000 feet / 300 Meter climb to Tengboche, which is what makes this day challenging. After reaching the peak there is a monastery that is definitely worth the visit, we even saw monks dancing preparing for a festival a few days later. Most people stay the night in a Tea House by the monastery, however, all rooms in that area were booked so we hiked another 20 minutes on the trail down another 330 feet/100 Meters to our tea house for the night. Most people hike to Dingboche instead of Periche, because the elevation is over 330 Ft / 100 Meters higher than Periche, and sleeping in Dingboche provides for better acclimatization; however, Jesse had a stomach issue from food in Namche so we decided to go to Periche, the site of the Himalayan Rescue Association, which includes a doctor’s clinic with a volunteer physician from the United States and a daily lecture from 3-4 PM on altitude sickness. This was the first day we began to see the incredible views of the Himalayas. It’s a relatively short hiking day with not too many challenges. We would recommend leaving earlier around 7 or 7:30 AM, to avoid other people on the trail. The first 1.5 hours, the hiking is downhill/flat and relatively mild, then there is about 30 minutes of steep climbing, before it becomes a wide relatively unmarked and easy climb for another 2-2.5 hours. After about 1.5 hours the trail splits between those going to Dingboche and those going to Periche. You reach a peak on the trail at 14,450 Ft / 4,400 Meters, with amazing views, then the trail goes downhill for about 500 feet/150 Meters for 30 minutes to Periche. This works out well in terms of the mantra “hike high and sleep low.” If you are staying in Dingboche instead of Periche we would recommend hiking up 330 Ft/100 Meters after you arrive and then going to your lodge. Its recommended to take your second and final rest/acclimatization day in Dingboche or Periche and to do a short hike that day with an elevation gain of at least 330 feet/100 Meters similar to the acclimatization day in Namche. However, this is not required and was not part of our itinerary. We left at 7:00 AM, we recommend going a little slower because the next day is the long hike to EBC and will be the hardest day of the trip. From Periche there is about 1 hour of flat/slightly uphill hiking (because most people stay in Dingboche, the trail in the morning is isolated and beautiful), we would recommend turning around several times on the way up as the views behind you are some of the best of the entire trek. The next 1.5 hours involves about 1000 Ft / 300 Meters of climbing, that is fairly steep until crossing the river and arriving in a small town for lunch. This is where the trail meets up with people coming from Dingboche and it gets relatively crowded with lots of other hikers, yaks and porters. There’s a steep 850 Ft / 250 Meter climb for 1.5 hours from lunch to 15,900 Ft / 4,850 Meters At the top of that climb there is a memorial site for lives lost at Everest with over 100 memorials. We spent some time there visiting each stupa and reading the sad stories engraved on them. The final hike to Lobuche is relatively easy, its another 1 hour with another 50 Meter rise (150 feet) to 16,075 Ft / 4,900 Meters. After you arrive we would strongly recommend, walking past Lobuche and climbing up the nearby hill about 300 Ft/100 Meters high (many people will be climbing to this locations). The views of the surrounding 26,000 Ft / 8,000 Meter mountains are incredible and it also follows our climb high, sleep low mantra for healthy acclimatization. Because of the high elevation, sleeping in Lobuche and the following night in Gorak Shep will be the most difficult of trek. The nights are cold and the air is thin so be prepared for two very hard nights of sleep. CLIMB HIGH, SLEEP LOW: Our evening acclimatization walk to the top of the hill by Lobuche. This is the hardest day because of the distance that is traveled as well as this being highest elevation of the climb. Its very important to start as early as possible as this not only gives you enough time to reach EBC, but to arrive early before the crowds are there. The clouds typically start covering the skies in the late afternoon, the earlier you are able to reach EBC the better the views. We ate breakfast at 5:30 AM (the earliest we were allowed to have breakfast) and were on the trail by 6:00 AM. Because it is extremely cold at this high elevation at 6 AM, our guide correctly recommended us to walk slowly and not to stop. We each wore about three layers plus long underwear, two pairs of gloves and followed our guide’s advice to just keep walking. He shared with us that past tour groups who stopped to adjust clothing ended up colder than if they just kept going. It was a 2.5 hour hike to Gorak Shep, which included a 1 hour relatively flat section with a 165 Ft/50m rise, followed by a 30 minute climb consisting of a 500 Ft/150 Meter elevation gain and then a 1 hour “Nepali flat” section, which is up and down to Gorak Shep. When you arrive at Gorak Shep (16,860 Ft / 5,140 Meters) we had a quick snack, dropped off our bags and headed to EBC. The walk to EBC is up and down never more than 75 feet/25 Meters at a time which is a challenge because of the high elevation. It’s approximately a 2.5 hour walk to EBC. If you go without stopping and leave early, EBC is relatively empty. We arrived to EBC around 11:30 and had it to ourselves for a few moments. Don’t forget that after reaching EBC you still have a 2 hour hike to get back- this was the part of the hike that was most difficult for Quan as the adrenaline that drove her towards EBC was gone for the descent. As we were there before the Everest climbing season, Base Camp was relatively quiet with the exception of a few yaks and 3 tents. There were apparently 5 individuals who would spend the night camping at Base Camp that night. As you approach Base Camp you can start seeing the peak of Everest but it is primarily tucked away. There is a very clear view of the famed Kumbu ice fall that climbers have to traverse to reach Base Camp 2. As we left EBC, an elevation of 17,598 Ft/ 5,364 Meters, higher than either of us had ever been, we saw the crowds arriving there and were thankful that we had a few moments to ourselves before they arrived. As we left EBC, we realized the day is not over as we had another 2 hours of hiking back to Gorak Shep and then a long night of sleeping at the highest elevation of the journey. As we were finishing our descent we saw some groups just starting the 2.5 hour trek to EBC in the late afternoon. By this time the clouds had moved over the mountain peaks and snow was starting to come down. These folks would have to make the descent by headlamp and their ascent would be in much colder conditions. Seeing them, we can’t iterate enough an early and steady ascent to EBC to avoid this type of scenario. After reaching EBC, most people decide not to climb Kala Pather as it is a very cold and a steep early morning climb. It’s a 1300 Ft/400 Meter steep climb to 18,200 Ft/5,550 Meters. It has one of the best views of Mt. Everest. Quan had thrown up the night before and was having stomach issues (it turned out she had a parasite) so Jesse and our guide Nuru woke up at 4:30 AM for the climb and to catch the sunrise (the sunrise is over the mountains to the East of Everest, not over Everest). It was extremely cold and the climb is usually 2 hours up and 45 minutes down, Jesse climbed up in 1 hour 15 minutes and down in about 35 minutes. At the summit is one of the closest views of the Everest peak. During the climb Nuru played a meditative chant on his phone and Jesse really appreciated the experience and the push towards the ascent. Following Nuru and Jesse’s ascent to Kala Pather they returned to the lodge at Gorachep to meet Quan for breakfast and start the ascent down. Typically trekkers descend to Dingboche at 4,400 Meters. However, Quan was still having stomach issues so we decided to go to Periche again to visit the clinic. We left at 8:30 AM, the first hour is the hardest, after leaving Gorak Shep there is a lot of traffic on the thin up and down “Nepali Flat” section. There is then about a 20 minute steep downhill section, followed by about 40 minutes of flat/slight decline to Lobuche (4,900 Meters). By the time you reach Lobuche, the elevation drop feels great and you start to move quickly. We hiked for about 1 hour slightly downhill to the Everest Memorial we had visited 2 days before. We then hiked another 30 minutes downhill to have lunch. Quan was really unwell so we moved at a much slower pace. After lunch the trail was completely empty and we hiked another 1.5 hours downhill and flat to Periche where Quan was diagnosed with a parasite and given a ton of medicine by the fine folks at the Himalaya Rescue Association. This was a 10 hour long day and was a harder downhill trek than the day before. Most decide to go to Tembuche, but we wanted to hike further to enjoy the warmer climate, better accommodations, and luxuries of Namche. Even though this day involves a 2,800 feet / 850 Meter drop in elevation, it is a difficult day with 3 hard uphill climbs. After leaving Periche, there is a 30 minute, 330 feet/100 Meter climb following the crossing of a river (Climb #1). The hike then goes downhill for about 1.5 hours to about 12,140 Ft / 3,700 Meters (to the location we stayed on our climb outside of Tembuche), followed by a 1 hour hike to the Monestary in Tembuche (Climb #2) where we stopped for lunch. It then is a 1 hour downhill section, which took us 3 hours to climb up on Day 4. After crossing a suspension bridge and the river, there is then a 2 hour climb up 1,000 Feet / 300 Meters (Climb #3) to the final climb of the day which is by far the hardest. Exhausted from the long day, it is then another hour to hour-and-a-half walk to Namche down the flat road we had walked on Day 4. At the end of the long day, with the comforts of Namche, our flight is now only 3 days away and we are only 8.5 hours of hiking from Lukla. Because we were only 8.5 hours away from Lukla and had 2 days to get there, we decided to have a relaxing day. We spent the entire morning at a the Shera Barista coffee shop in Namche, eating 2 orders of French Fries, Nepalese Momo’s and Pasta. We had spent the last two weeks eating dahl bhat and our taste buds were so excited to eat something different! We then left at 1:00 PM and hiked the 2.5 hours to Manjo, this was the easiest day of the trip as it was entirely downhill, descending on the steep climb we had done on day 2. This 6 hour hike was downhill to Phakding for the first hour, then was Nepalese flat for the remaining 5 hours, going a little more uphill than downhill. We left at 7:30, and after a 1 hour lunch stop at the delicious Mountain View Restaurant (the freshest food of the trip) we arrived in Lukla at 2:30 for our flight the following day. Overall a relatively easy day of up and down never more than 100 feet/30 Meters at a time. We shared a beer with our guide Nuru and our Porter Jumbo to celebrate and spent the night in Lukla in order to fly out the following morning. So we did it! We hiked all the way up and all the way down. This was perhaps one of the hardest physical and mental endurance either of us have been through. Though we were lucky to avoid any type of altitude sickness, we each had our own battles with physical illness on the trail. Despite this, we are so glad we did this. On the trail we were up close and personal with the majesty of some of the most beautiful peaks in the world. The troubles on the trail bonded us together as we supported each other through our illness. We were also lucky that serendipity allowed us to share a few days on the trail with our friends Elise and Ze who we met in Mongolia. Our trip was organized by Sherpa Society Trekking which is run by the family of Nidup who we also met in Mongolia. The entire time we felt cared for as family. And as if the world wasn’t small enough, we learned that our guide Ang Nuru is cousin brothers with Dickey and Lapka Sherpa who run Sherpa House in Golden, Colorado where we were married.